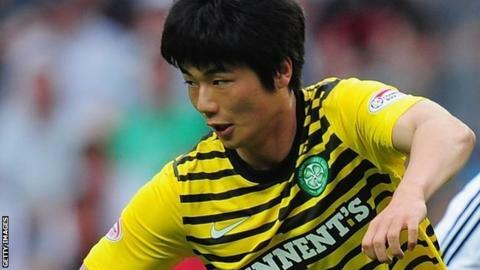 Swansea City have broken their transfer record to sign Ki Sung-Yeung from Celtic, subject to a work permit and international clearance. South Korean Ki, 23, had a medical in Swansea on Friday before signing a three-year contract, with the fee to Celtic believed to be around £6m. "When I look at Swansea I see a club that is growing," said Ki. "The style here is very attractive to me. "I think I can grow as a player and help the club move forward." Swansea manager Michael Laudrup says Ki, who made 34 appearances for Celtic last season, will add midfield dynamism to his side. "He's an important player to have in midfield," said Laudrup. "We lost Joe Allen [to Liverpool] so it's important, looking at the strength of the squad, to have a dynamic player like him. "The players we have signed here and the players we will sign are players that can fit into our style. "He's already played a couple of seasons in British football and that's very important. The players who have come in from abroad have had a great start but I think experience of this kind of football is important as well." Ki won a bronze medal with South Korea at the 2012 London Olympics, and scored a penalty in their quarter-final win over Great Britain in Cardiff. His move to Swansea almost doubles the club record fee of £3.5m paid for Danny Graham a year ago, and he is Laudrup's seventh signing since taking over in June. Kaiserslautern striker Itay Shechter, whose loan move continues to be delayed by paper work, is another imminent signing, and Laudrup expects plenty more movement before Friday's transfer deadline. Valencia winger Pablo Hernandez is on Swansea's radar, although the Spanish club have so far been reluctant to enter into discussion with the Premier League side. Laudrup, though, said he was encouraged by reports that suggested Hernandez wants to join the club. "It's always nice when players say they would like to come a club, to play in a team or for a manager," he said. Departures are also expected, with the club expecting an offer from Manchester City for winger Scott Sinclair, who is refusing to sign a new contract. The 23-year-old scored Swansea's fifth in their 5-0 demolition of Queens Park Rangers on the opening day of the season, and Laudrup says he will have no hesitation in selecting Sinclair again despite his uncertain future. "He is 100% committed to Swansea while he's here and that's important thing for me as the manager," he said. Fringe players such as Stephen Dobbie (linked with Blackpool), Garry Monk and Alan Tate have been told they will find first-team opportunities limited under Laudrup.